Why was the Data Loading Module Developed? Originally, the Exporting community wished to have a mechanism that allowed them to report their Non-U.S. exports electronically, instead of by the existing paper based method. To this end, the CAED Program was developed and introduced. In the CAED program, a windows based software (which allows completion and electronic submission of the B13A) was developed and distributed to interested participants. CAED participants could use the software to complete and transmit Export Declarations (via the Internet) on a shipment by shipment basis, from their place of business. However, some exporters indicated that although they liked the concept of the CAED software, it constituted a "duplication of work" on their part, since all the information required for the B13A had already been entered into their current legacy system. It was also stated that given the number of declarations completed on a daily basis, it did not make sound business sense to have to "re-do" their Export Declarations just so they could submit them electronically. The exporting community then suggested that in addition to the CAED software, we provide an option which would allow an organization to use the information already stored in their legacy system as input to the electronic Export Declaration. With this as a goal, the Data Loading Module was developed. Who should use this Module? Exporters/Agents who wish to electronically submit their Export Declarations to the Federal Government of Canada and already have an internal system that generates all traffic documents (including a paper B13A). Exporters currently reporting their exports through participation in the Summary Reporting Program, via tabulations generated from an internal system. What does the Data Loading Module do? 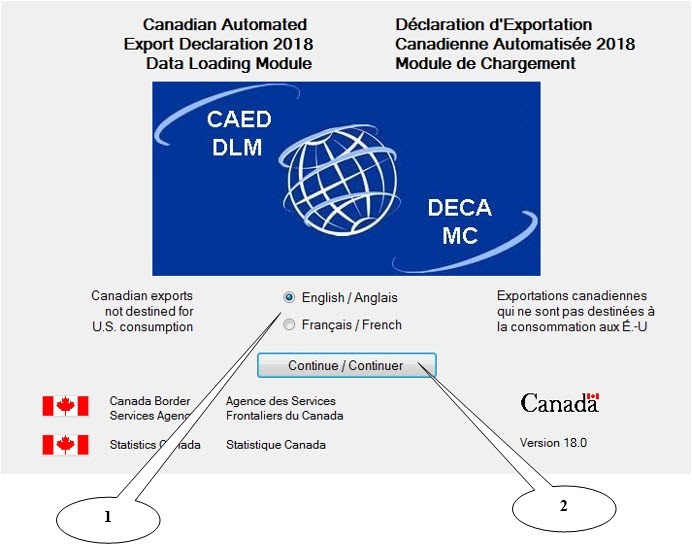 Electronically transmit the resulting Export Declarations to the Federal Government of Canada using the CAED software. Who in my organization should be involved with the formatting of our internal legacy system to CAED requirements? Usually this would involve someone from your organizations Informatics section (IS). It might be the person responsible for the development of your internal "traffic-document generating system", or it could be the resident technical person responsible for support. It should be stressed here that the Data Loading Module is a technical solution that requires some initial technical investment from the user organization. How do I know if this is really for my organization? How many declarations do I complete on a daily/monthly basis? Is there sufficient quantity to justify IS involvement? Or, should I just use the existing turn-key solution that is offered by the CAED software? View the Screen Cam Demo of the CAED software. The demo can be found on the CAED Web site or requested through the CAED Help Desk of Statistics Canada (1-800-257-2434 or 1-613-951-6291). Does your organization wish to go this route? Does it have the technical capabilities to send encrypted FTP or encrypted E-mail transmissions via the Internet? Remember, the encryption and transmission software is already bundled into the CAED software. All the user must have is some level of Internet access. Even if you have a corporate firewall, the software allows your IS person to configure the "firewall tab" in the CAED software to allow outgoing transmissions. 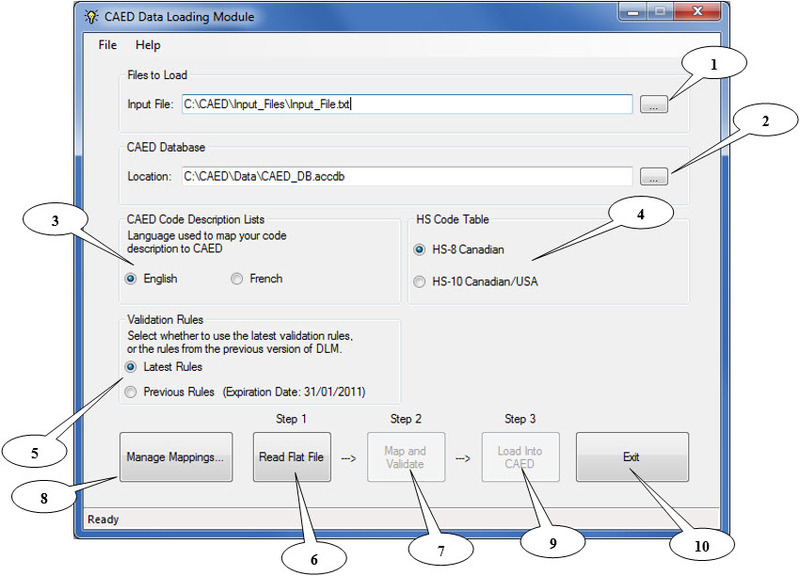 The Data Loading Module is included with the CAED software. As mentioned earlier, the Data Loading Module feeds a flat file into the CAED software in order to use the transmission protocols embedded in it. Both the CAED software and the Data Loading Module are available free of charge to all users, upon registration to the CAED program. The software is available as a download from the CAED site or on CD-ROM. Each input file for the DLM must follow a specific format. A file can contain the information of many B13A forms. The information for a specific B13A form is composed of five different types of records: Header, Detail, Permit, Container and Reference. A letter is associated with each record type: H: Header, D: Detail, P: Permit, C: Container, R: Reference. The first character of each line in the file is the record type and it identifies the type of information contained on that line. The first two record types (Header and Detail) are mandatory. The last three record types (Permit, Container and Reference) are optional. Each B13A form must contain one and only one Header record and at least one Detail record. All the records associated with a B13A form must follow each other (grouped together) and they must be in a specific order. Here is an example of a file that contains three B13A forms. The first B13A form has only one detail line with no permit, no container and no reference. The second B13A form has two detail lines, no permit, three containers and no reference. The third B13A form has three detail lines, three permits, two containers and one reference. Before the Data Loading Module can be used for the first time, an activation code must be entered. This activation code only needs to be entered once and is available free of charge. Upon starting the application, the welcome screen will appear. The application can be run in either "English" or "French" by selecting the appropriate option. Once the language is chosen, press the button "Continue / Continuer". Each section and control of this form has been numbered. By understanding the function of each section/control numbered in the main screen, the user will be able to optimize use of the Data Loading Module. Press the button with "…" next to the Input file location text box in order to browse the file directories and locate where the input file is stored. Once in the correct directory, select the input file and then press Open. Press the button with "…" next to the CAED database location text box in order to browse the file directories and locate where the CAED database is stored. 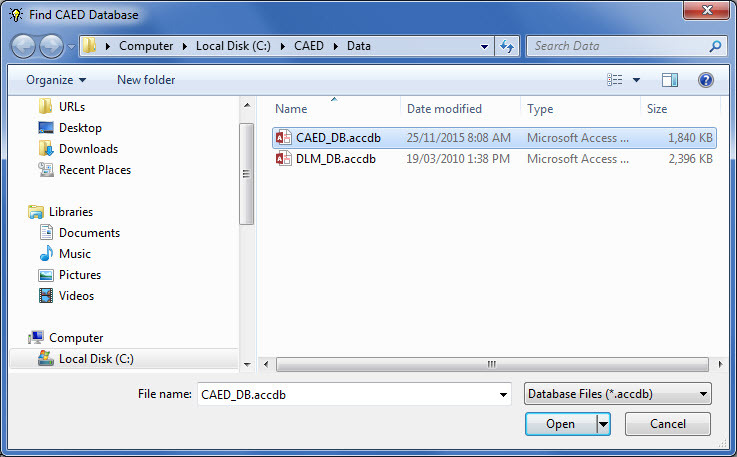 Once in the correct directory, select the database file (Called CAED_DB.accdb) and then press Open. 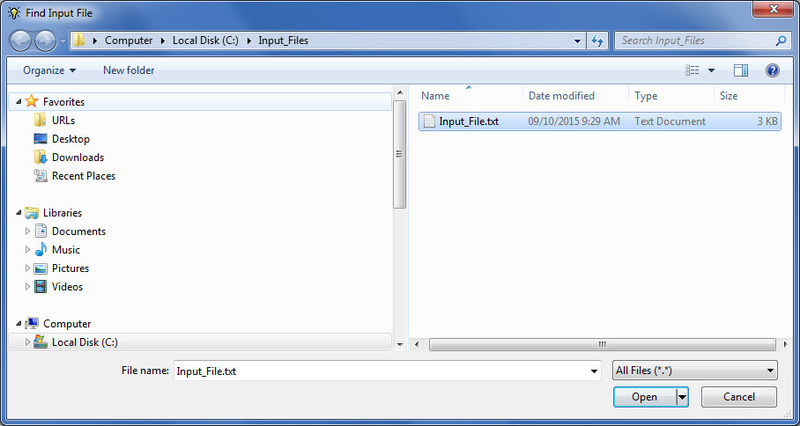 The file location will appear in the database location text box. If you are using the stand alone version of CAED, this database is C:\CAED\Data\CAED_DB.accdb if you have not changed the default installation directory when installing the CAED software. The next section in the CAED Data Loading Module Form is the CAED Code Description Lists. In this section one would indicate whether the language of the data in the input file is English or French. It is possible to operate the Data Loading Module in English even if the data itself is in French and vice versa. It is essential that the correct language be selected as different libraries are used for each selection during the mapping and validation process. Although the CAED software allowed only pre-defined Canadian HS-8 export codes, it was acknowledged that many user's legacy systems code to the Canadian or U.S. 10 digit import level. Consequently, choices were added in order to allow the user to select one of the two HS coding levels that could be employed by the user's legacy system. When selecting the Canadian 8-digit export code, only valid HS-08 codes will be permitted. Invalid codes will abort the validation process until they are corrected at the source. When selecting the U.S. or Canadian 10 digit import code, the Data Loading Module will validate the HS code to the 6-digit level. The user will then be required to select the appropriate HS-08 export code using the presented drop-down lists. Remember, once a "relationship" is established, the system will not re-prompt the user if that same code or description is encountered in subsequent loads. Until that "relationship" is terminated, (see Section 8: Manage Mappings) the Data Loading Module will automatically recognize that code or description as it was "established". There is a transition period where you will have a choice of using the validation rules from the previous version of the Data Loading Module, or the latest validation rules. This transition period exists because changes to the record layout or validation rules may have an impact on the computer system you use to create input files. The transition period must be used by your information technology specialists to adapt your system to correctly use the modified record layout and validation rules. The previous validation rules will normally have an expiration date, which is displayed beside the Previous Rules option. You can use the previous validation rules up to this expiration date, but once the previous rules have expired, you will be forced to use the latest validation rules. Note: the Previous Rules also use the record layout from the previous version of the Data Loading Module. For version 11.0, there were changes to the record layout, and you will need to modify your input file before moving to the latest validation rules. When the Read Flat File button is pressed, the Data loading module reads the flat file specified in the "Input file" section, to a temporary database, "DLM_DB.accdb". At this time, each record is checked to ensure the proper number of fields (75 in a header record, 15 in a detail record). If there are any problems during this process, an error is generated and a report of all errors generated during the read process will pop up. These errors must be resolved in the input file before they can be read properly. If there are no errors, the "Map and Validate" button becomes enabled. In the CAED software, one of the breakthrough features of the application was its ability to convert and/or validate nine text fields to numeric code sets prior to the encryption and electronic transmission of the Export Declaration to Statistics Canada. Consequently, in order to import the user's legacy system descriptions of these fields into the CAED software, it becomes mandatory that this process be emulated. Therefore, during the mapping process, the Data Loading Module will allow the user to build "relationships" for each unrecognized description (or code) that the wizard finds in any of these nine fields. The fields that are mapped are Province, Country, Reason for Export, Mode of Transport, Port of Exit, Unit of weight, Currency List, HS-10 and Unit of Measure. For example, if in the user's legacy system, the field "province of origin" has BC instead of British Columbia, the "mapping wizard" will prompt the user to find the correct corresponding province through a drop-down list. The wizard will automatically find the closest match. Once the user "OK's" a "relationship", every subsequent time the "wizard" encounters BC, it will automatically match it to the established CAED Code Set without ever again prompting the user for a response. 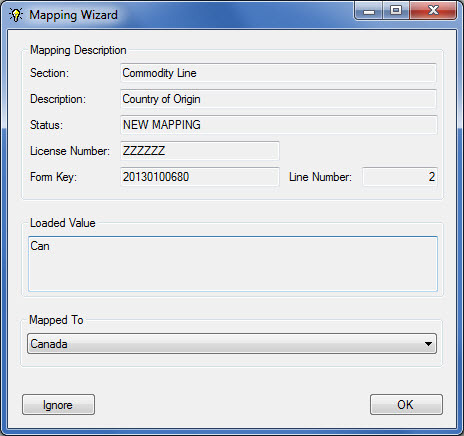 Clicking the "Ignore" button on the "Mapping Wizard" screen allows you to skip the mapping process for the field displayed on the mapping wizard. Clicking the "Ignore" button will generate a field error during the validation process, but enables you to skip a particular mapping without aborting the entire mapping and validation process. This is useful in cases where you are unsure as to which CAED code to select for the mapping relationship, but wish to continue mapping other fields in your input file. 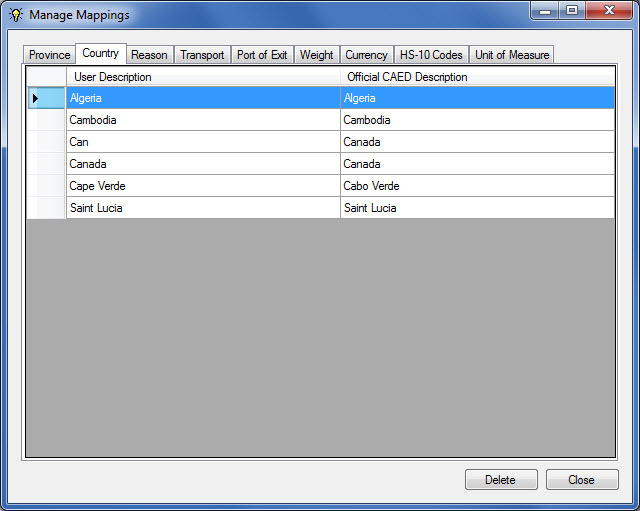 First, the "mapping wizard" is enabled in order to map nine specified fields (that are found in the header and detail records) to the CAED code sets and descriptions. The module validates all fields in the "Input file" to ensure proper format and to ensure that no mandatory fields are missing (For validation criteria, please see the Validation and Mandatory columns of the header and detail record layout in appendix A). **Note** If any data element fails validation, the Data Loading Module will display a report identifying the data element(s) requiring corrective action(s) and their exact location(s) in the source-data file. After all identified failures are rectified at the source, the Data loading module can then be re-initiated. Once a relationship has been "established" or learned, it is stored in one of nine tables. In order to change a relationship, the "manage mappings" feature must be accessed. Once accessed, the desired table can be selected and then any or all of the "relationships" for that table can be either viewed or terminated. Termination is accomplished by simply highlighting the relationship(s) no longer needed, and then clicking the "delete" button found at the bottom of the screen. Once the mapping and validation is completed, the "Load into CAED" button is enabled. When the "Load into CAED" button is pressed, a unique Form ID is generated for each form processed by the Data Loading Module. The validated forms are then transferred to the CAED software. Once this is accomplished, a message will appear: "Data successfully transferred to CAED software". If one or more forms cannot be transferred to CAED, an error message will be displayed listing the Licence Number, Form Key from the input file, and the generated Form ID for each form that could not be transferred. Finally, press the "Exit" button at the bottom of the screen and move on to the final step in the process: The transmission of the data with the CAED software. For more information about the transmission process with the CAED software, please consult the CAED user guide. This document can be found on the CAED CD. *** If you are using the Previous Validation rules, you must use the record layout from the previous version of the Data Loading Module. 13 222 251 Exporter province/state 30 Yes, if Exporter country is Canada or United States. 16 274 288 Exporter postal/zip code 15 Yes, if Exporter country is Canada or United States. 27 546 615 Service provider name 70 Yes, if you use a service provider. 35 791 800 Service provider telephone 10 9999999999 Yes, if you use a service provider. 45 1050 1059 Certifier telephone 10 9999999999 Yes, if certifier country is Canada or United States. 60 1316 1365 Reason for export 50 Yes, if goods not sold. 12 418 431 Quantity 14 Numeric with no thousands separator and a period as a decimal separator. Maximum of 3 decimal digits. Yes and cannot be zero. Note: The "Province of Origin" field must be mapped to a Canadian province/territory, even if the country of origin is not Canada. If the goods were originally imported into Canada and are being exported in the same condition, indicate the province the goods were shipped from. Note : This type of record is not mandatory. Note: This type of record is not mandatory. Each field has errors that may be generated while running the CAED Data Loading Module. The first letter of an error number indicates which record type the field is from (Header =H, Detail=D, general error = E). Following the first letter is a number which corresponds to the field which contains the error. The final letter of an error number represents the type of error. There are five general types of errors that may occur in the Data Loading Module: missing mandatory field errors(M), datatype/validation errors(I), inactive code errors (A), warnings (W), and other errors. By looking at error "H10M" we know that the problem is in the Header record with field number 10 (Exporter street) and this mandatory field is missing. An error number ending with the letter "I" indicates an invalid datatype or invalid value in a field. For example, with field #49 "Certifier Status" the error number "H49I" may be generated. Field # 49 must have the value 1 or 2 and if the data input for this field is another datatype or value (i.e. 7), error "H49I" will occur. An error number ending with the letter "M" indicates a mandatory field is missing. For example, Fields #3, 8, and 9 in the header record are all mandatory fields (see the record layout in Appendix A to see which fields are mandatory) and have mandatory errors that may be generated. An error number ending with the letter "A" indicates a field has been mapped to a value that is no longer active. For example, if a value for field #13 "Exporter Province/State" was previously mapped to "Yukon/N.W.T. ", the error number "H13A" will be generated if the mapped value is not updated, since "Yukon/N.W.T." is not an active province/state. An error number ending with the letter "W" is a warning. These warnings will be displayed on the error report, but they do not prevent the form from being loaded into CAED. For example, if in a detail line field #3 "Country of Origin" is "United States", the warning "D03W" will be generated. If this is the only error/warning generated, the CAED form can still be loaded into CAED. An example of an error from the "other error" category is E001. This error number may be generated when the data loading module verifies that at least one detail record exists for each header record. If a header record exists with no matching detail record, the error "E001" will be generated. Note that errors in the "Other Errors" category have no letter at the end of the error number. It should also be noted that field #0 with the field name "N/A" will appear with "Other" errors that are generated. This is because the error is not applicable to any specific field, it is an error associated with an entire record. The following list contains all the errors that may be generated by the Data Loading Module. The Errors have been placed in 5 lists: header record errors, detail record errors, container record errors, permit record errors, and "other" errors. Please see Appendix C to view a sample Error report, to learn how to interpret errors in the report, and to learn tips to resolve errors in your input file. 2 License Number H02I Invalid license number. 3 Exporter authorization ID H03I Invalid Authorization Number. Expected format AA9999. 5 Source Type H05I Invalid source type. 6 Transaction Type H06I Invalid transaction type. 8 Exporter name H08M Missing value. 9 Exporter business number H09I Invalid Business Number. Expected format: 999999999RM9999. 10 Exporter street H10M Missing value. 11 Exporter city H11M Missing value. 13 Exporter province/state H13I Invalid Province/State. 15 Exporter country H15I Invalid Country. 16 Exporter postal/zip code H16I Invalid Postal Code. Expected format: A9A9A9. 17 Exporter telephone H17I Invalid Phone. Expected format: 9999999999. 18 Exporter telephone extension H18I Invalid extension. Expected format: 0000. 19 Exporter fax H19I Invalid Fax. Expected format: 9999999999. 20 Consignee name H20M Missing value. 21 Consignee street H21M Missing value. 22 Consignee city H22M Missing value. 25 Consignee country H25I Invalid Country. 27 Service provider name H27I Invalid service provider name. 28 Service provider street H28I Invalid service provider street. 29 Service provider city H29I Invalid service provider city. province/ state H31I Invalid service provider province/state. H31A Inactive service provider province/state. 33 Service provider country H33I Invalid service provider country. H33A Inactive service provider country. postal/ZIP code H34I Invalid Postal Code. Expected format: A9A9A9. 35 Service provider telephone H35I Invalid phone. Expected format: 9999999999. 36 Service provider telephone extension H36I Invalid extension. Expected format: 0000. 37 Certifier name H37M Missing value. 38 Certifier street H38M Missing value. 39 Certifier city H39M Missing value. 41 Certifier province/state H41I Invalid province/state. 43 Certifier country H43I Invalid country. 44 Certifier postal/zip code H44I Invalid postal code. 45 Certifier telephone H45I Invalid phone. Expected format: 9999999999. 46 Certifier telephone extension H46I Invalid extension. Expected format: 0000. 47 Certifier fax H47I Invalid fax. Expected format: 9999999999. 48 Certifier company name H48M Missing value. 49 Certifier status H49I Invalid certifier status. 50 Commodity gross weight H50I Invalid commodity gross weight. Value must be a number with a maximum of 3 decimal digits. 52 Commodity gross weight unit of measure H52I Invalid gross weight unit of measure. H52A Inactive gross weight unit of measure. 54 Freight charges H54I Invalid freight charges. Value must be a number with a maximum of 2 decimal digits. 56 Commodity currency of declared value H56I Invalid commodity currency of declared value. H56A Inactive commodity currency of declared value. 58 Mode of transport H58I Invalid mode of transport. 60 Reason for export H60I Reason for export is invalid. H60A Inactive reason for export. 61 Vessel name H61I Invalid Vessel Name. 63 Country of final destination H63I Invalid country. H63A Inactive country of final destination. 64 Date of exportation H64I Invalid date format. Expected format: YYYYMMDD. 66 Port of exit H66I Invalid port of exit. H66A Inactive port of exit. 68 Certifier E-mail Address H68I Invalid Certifier E-mail Address. 69 Number of packages H69I Invalid number of packages. Value must be an integer. 71 Kind of packages H71M Missing value. 73 Transportation document number H73I Invalid Transportation Document Number. 3 Country of origin D03I Invalid country. D03W Warning. All goods of U.S. origin exported from Canada are subject to export control. Where no individual Export Permit is applicable, you must cite General Export Permit 12 (GEP 12). 5 Province of origin D05I Invalid province. 6 HS Code D06I Invalid HS code. 7 Product description D07M Missing value. 8 Conveyance identification number D08I Invalid Conveyance ID number. 12 Quantity D12I Invalid quantity. Value must be a number with a maximum of 3 decimal digits and cannot be zero. 14 Unit of measure D14I Not a valid unit of measure for the HS code. D14A Inactive unit of measure. 15 Value FOB point of exit D15I Invalid datatype. Value must be a number with a maximum of 2 decimal digits. 2 Container Number C02I Invalid Container Number. C02W Warning. This field must be amended to include the container number at least two hours prior to the goods being loaded on the conveyance for export. NOTE: TO BE DETERMINED is not an option when the goods are exported by highway. 2 Permit Number P02I Invalid Permit Number. P02W Warning. A Permit Number must be entered for a country on Canada's Area Control List (ACL). 0 N/A E001 Header record without matching detail record. 0 N/A E002 The input file must start with a Header line. 0 N/A E003 Invalid header record length. 0 N/A E004 Invalid detail record length. 0 N/A E005 Invalid permit record length. 0 N/A E006 Invalid container record length. 0 N/A E007 Invalid reference record length. 7 Form key E008 This record could not be inserted into the Data Loading Module database because the FORMKEY was not unique. Change the FORMKEY to ensure that it is unique. 7 Form key E009 This record could not be loaded in the Data Loading Module database because a FORMKEY field in the header record is missing. 0 N/A E010 Invalid record type. This report will pop up during the Read or Map and Validate process when there are errors that must be addressed in order to fix the input file that the user is trying to load. 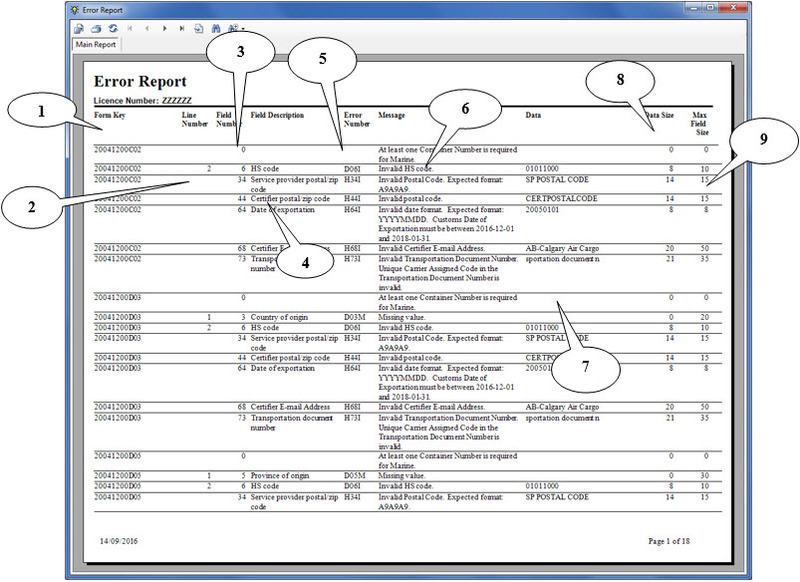 Each row in the report represents one error that must be addressed. Once the user has repaired all of the error problems, they should "Read" (press the "Read Flat File" button) their input file again. The numbered items in the report each have a detailed description/explanation in the following list. The form key is given to help locate which record has an error. The Form Key is the seventh field in each header line, and may be used to find the record containing the error. This will only have a value for the Detail records. It is a derived value based on the physical location of the detail record in the input file. A line number of 3 would mean the third detail record of the header record having the form key indicated. Once the line (record) containing the error has been located, note the Field Number and description. This number identifies the field inside the line (record) which contains the error. Note that the Field Number corresponds with the order of the fields in each record – therefore, Field # 3 is the third field on the line and Field #54 is the 54th field on the line. This column gives a brief description of what the field should contain. For example, "Exporter telephone" should contain a telephone number. This column gives the Error number that is occurring for the indicated field and record. See Appendix B for an explanation of how to interpret error numbers. This column describes the error. For example, an error message "Invalid value. Expected format: A9A9A9" in a postal code field would mean that the expected format was not found. The data in this example might be "A999A9" where the second nine should have been a letter. This column will show the data that was found invalid, wherever possible. If the field was a missing mandatory field, the data column would be empty. This column will display the length of the data where applicable. This column displays the maximum field size allowed. Note: The RECORD TYPE fields have been highlighted so that you can see where each line begins. An error will be generated if the "Date of Exportation" (YYYYMMDD) is not between "20171201" and "20200131".